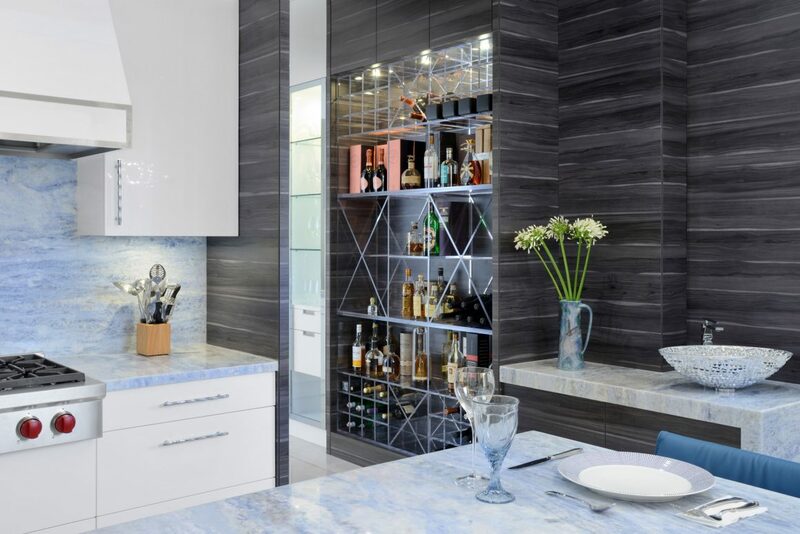 Sophisticated and modern: These are the words used to describe this kitchen. 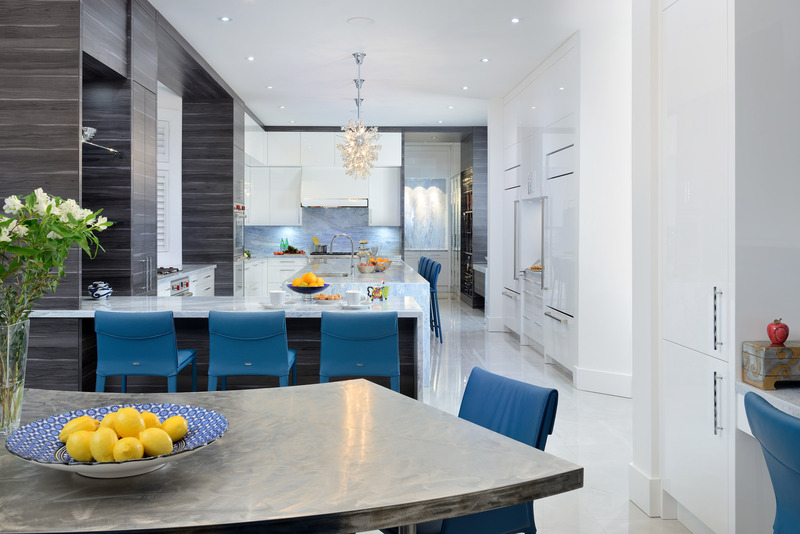 But it is the blue colour – in the quartzite counters, the island stools, the dining chairs, and the subtle veins in the porcelain floor tiles – that provides a coherent element of uniqueness. The pendant lights are in a traditional glam style. Toronto architect Thomas Tampold describes this uniquely spectacular kitchen simply: “I’ve never seen anything like it,” he says. Its design causes visitors to pause and take stock. The countertop is discreetly integrated into the tall open cabinet unit next to the windows, giving a little added detail to the layout. 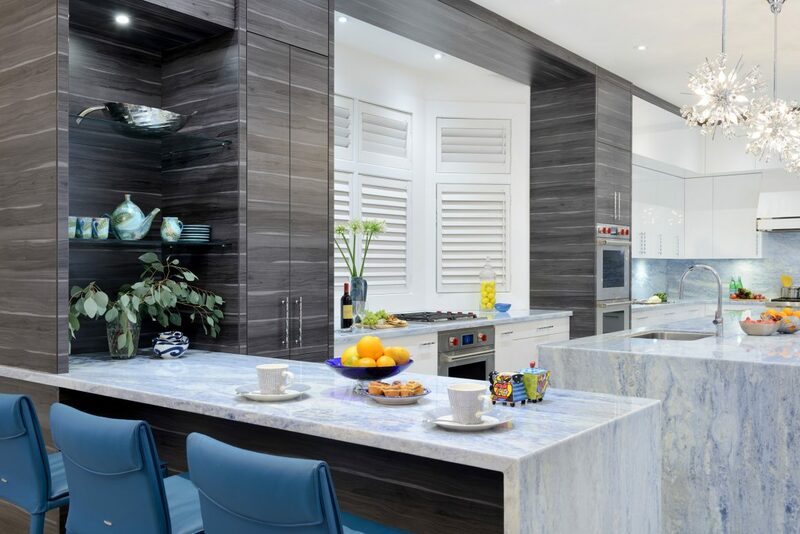 Indeed, this space within a single-family home just north of midtown Toronto has elegance, style, size, surprises and dreamy blue quartzite countertops. Then, there are the details. A designer glass vessel sink from Canaroma, imported from Italy, sits atop a small waterfall counter just outside the bar area. And like a piece of art, finding the right words to describe it is a challenge. There is a lot of kitchen here. But before we get down to the form and function, let’s talk about the colour. A request of one of the owners at the outset of this renovation was blue countertops. It’s not a common must-have, so it required some research. Diamond came up with this light stone surface – quartzite – with intricate white veining. It is also used on the backsplash behind the range and along the wall in the bar area. 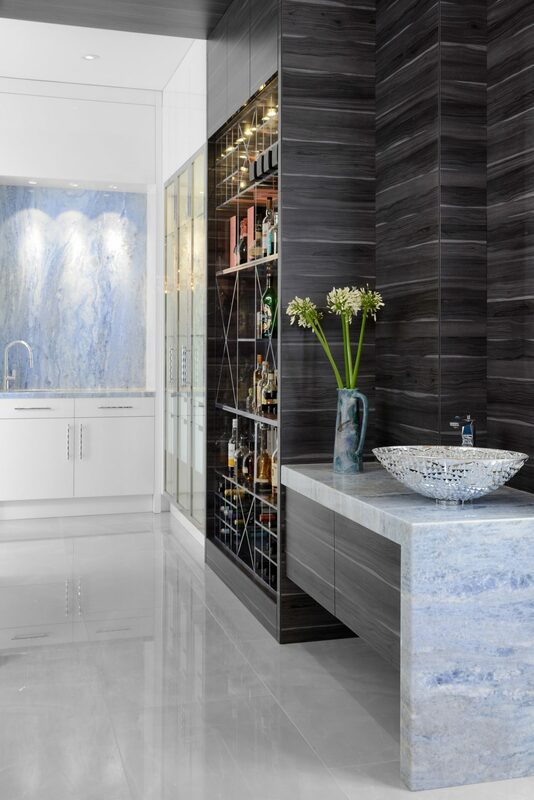 An open floor-to-ceiling unit finished in the grey reversed plastic laminate and appointed with glass and chrome shelves serves as a liquor cabinet that would not look out of place in an upscale restaurant. Then, Diamond explains, she wanted to add something grey. And that is when she turned to Tampold, architect and owner of Yorkville Design Centre, an exclusive retailer of Downsview Kitchens. The cabinets were custom-built by Downsview Kitchens. But they are unique in more ways than the word “custom” suggests. They are covered in plastic laminate panels, but instead of using the lacquered finish, Tampold reversed the cladding. What is seen – the matte grey with the white veined pattern – is actually the backside of the plastic laminate. At the back of the kitchen, display cabinets add sophistication and grandeur to the space. “It gave it a softer look with the matte finish, an interesting look,” explains Tampold. 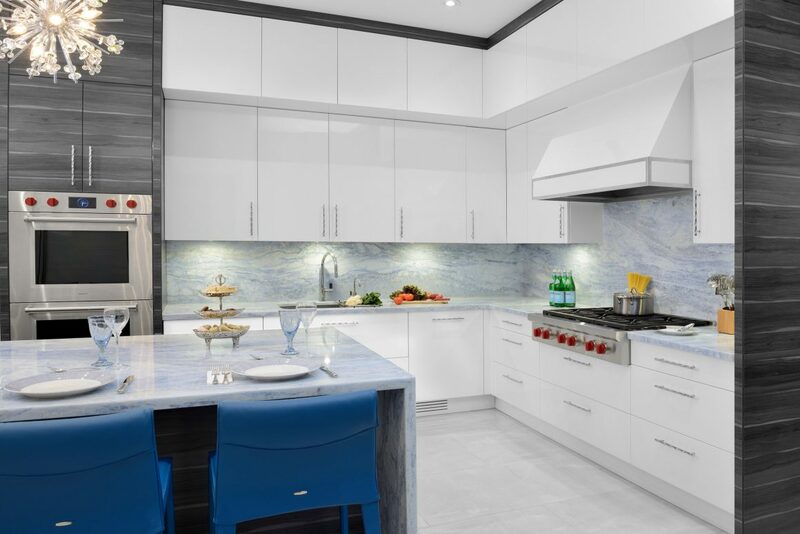 The president of Downsview Kitchens personally approved the use of the product in this out-of-the-ordinary way, he adds. 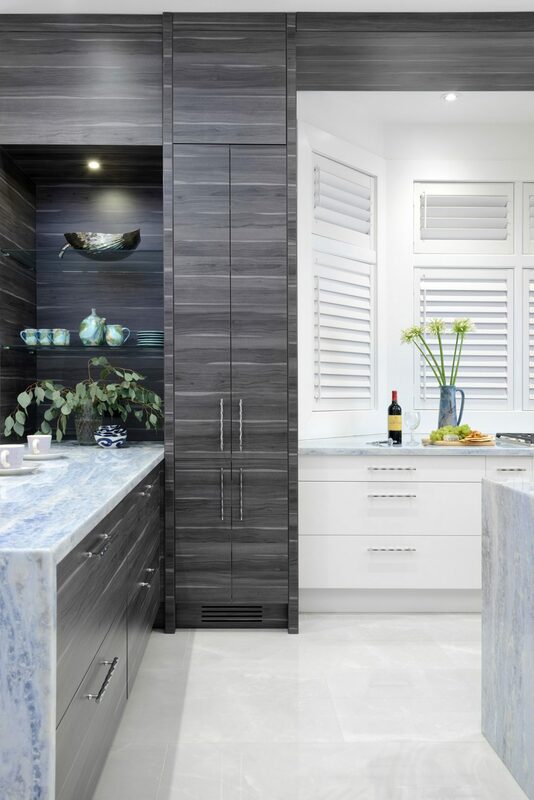 The grey cabinets were then complemented with high-gloss lacquered cabinetry, adding a sense of sophistication. And all three elements – the white, the grey and the blue – interact throughout the entire space. 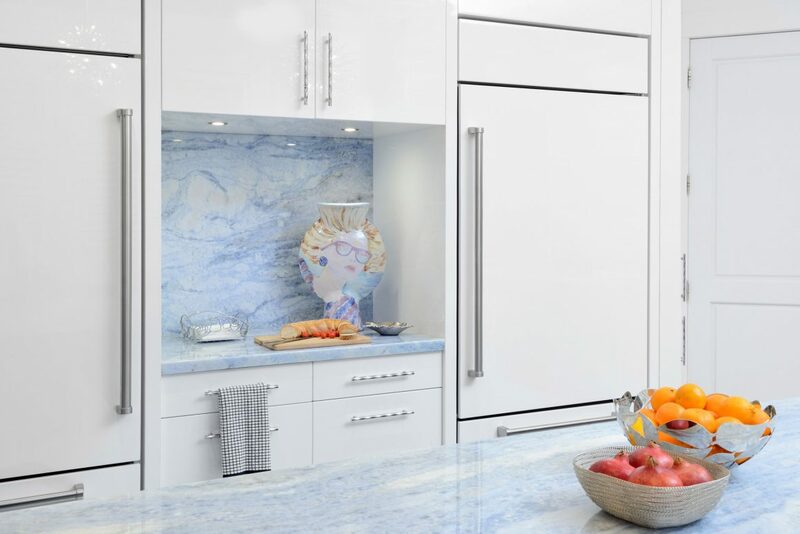 The blue quartzite on the counters is also found on the walls under the high-gloss white lacquered upper cabinets. And space is another way this kitchen defines itself. Covering an area that is more than 1,080 square feet, the room comes complete with three refrigerators, four sinks, two ovens, a bar area, large display cabinets, a desk nook equipped with a wall-mounted flat-screen television, and eight separate counter areas. This grandeur that Diamond refers to reveals itself in waves. It is not evident all at once. 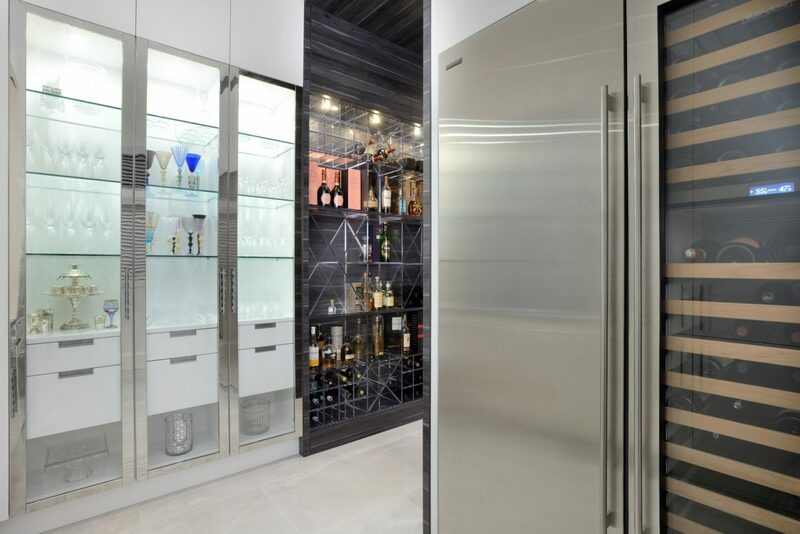 A walk to the rear of the kitchen, toward the bar area, reveals the custom display units – an open floor-to-ceiling cabinet finished in the grey reversed plastic laminate and appointed with glass and chrome shelves that serves as a liquor cabinet. It would not look out of place in an upscale restaurant, with its three full-length chrome-framed glass doors, interior lighting and storage drawers. There are other details, too – exquisite and surprising ones.